From Modesto, Yosemite is only a two-hour drive east, offering a day trip or an overnight, depending on preference. Often, lodgings at Yosemite are booked well in advance, especially campgrounds, so advance planning is advised. There are six main regions of the park. Most popular is Yosemite Valley, which is open year round, and is world-famous for its amazing views of impressive waterfalls, rock formations and flora and fauna. With winter weather comes Yosemite's open air ice-skating rink, where visitors skate beneath the majestic Glacier Point and Half Dome formations. Glacier Point is a one-hour drive from Yosemite Valley and offers an exhilarating overlook of the valley 3,214 feet below. Wawona and Mariposa Grove serves as the southern entrance of the park, with huge Giant Sequoias and a collection of historic buildings which showcase the beginnings of the park serving as a tourist attraction. Tioga Road and Tuolumne Grove at the western edge of the park offers forests, meadows and lakes to explore. 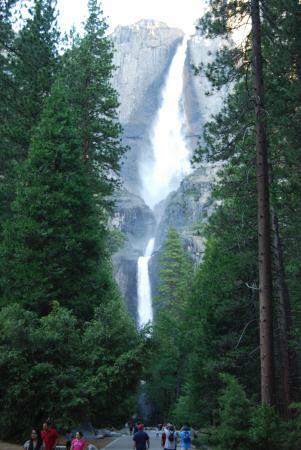 Visitors will find Tuolumne Grove quieter and less congested than other park areas. Tuolumne Meadows is on the eastern side of the park, providing visitors with an opportunity to hike through the sub-alpine meadows of the granitic High Sierra. Hetch Hetchy Reservoir, a municipal water and hydroelectric supply, is open from May 1 to Labor Day. Swimming is not permitted, but beautiful views and many hiking trailheads still allow for fun. Badger Pass could be considered Yosemite's winter wonderland. Skiing, snowboarding, and tubing areas are open as weather permits. Warm weather seasons are the park's busiest time of year, as the roads are accessible, but there are tons of winter activities, including cross-country skiing and outdoor ice-skating. Be sure to pick up or download the oft-published Yosemite Guide, which offers maps and general information for all the park's services, the many organized events — and highlights the events especially for children — and detailed maps. Additional information to help in planning your visit to Yosemite National Park is available online. How can Yosemite National Park receive anything BUT a five star review?!? This crowned jewel in California's amazingly diverse landscape is only a two-hour drive from Modesto and offers visitors a chance to step into a natural wonder for the day. We arrived at the park mid-morning, first spotting Bridalveil Fall as soon as we began a descent into the valley; from that point on, there was not a moment that elapsed when some other awe-inspiring waterfall, rock formation, lush meadow, or clear river was not right there to be amazed by. After parking in the group parking lot and taking the bus to Yosemite Lodge, we ate lunch in the cafeteria-style restaurant adjacent to the lodge. The lunch items were reasonably priced and the wide selection allowed each of us to choose exactly what we were in the mood for. Hot lunch items were available, including full meals (roasted chicken breasts, mashed potatoes, green beans and fresh fruit), pizzas by the slice, grab-n-go sandwiches and salads, and more. Since the kids and I had never been to Yosemite before, we decided that we would acquaint ourselves with the park by taking a two-hour open-air tram tour of the valley floor. For $75, our family of five enjoyed the guided tour which stopped several times for photo ops and restroom breaks. My husband didn't have to miss out on great views while driving to the area's hotspots, and the kids weren't arguing about how they couldn't see from their seats: all of Yosemite's valley was visible to EVERYONE. The stories that the tour guide shared were interesting for older children and adults; our youngest child only took away that rock climbers sleep on cots that hang off the side of the sheer cliffs they climb. Because we were only staying for the day, the tram tour did take up quite a chunk of our time at the park. As we visited in July, the sun was still up after disembarking the tour, and we were able to hike to Lower Yosemite Fall just behind the Yosemite Lodge where the tour originated. Due to the heavy snowpack feeding the falls this particular year, the Lower Fall was roaring, flowing very heavily and very fast, creating its own wind and mist: it was simply AMAZING.